Shaped by master Italian upholsterers and available in a range of finishes, Byron makes for an elegant dining experience with external stitch detail throughout. Concealed beneath the upholstery is a steel frame, padded seat and swooped backrest, which together creates a slender silhouette and supportive sit. Made in Italy and Exclusive to Heal's. Upholstered in luxurious buffalo leather, Byron's slender elegant lines conceal a strong internal steel frame. 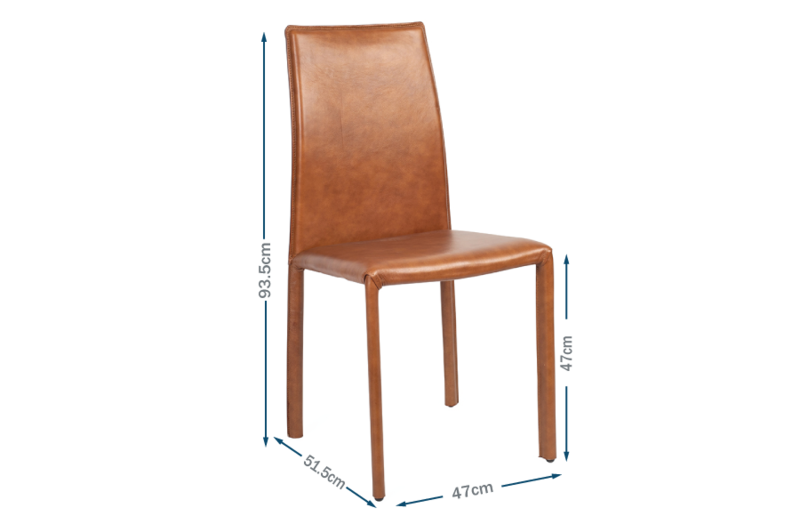 Slender legs and swooped backrest provide contemporary profile. External stitch detailing created by master Italian upholsters. A slender steel frame and padded seat are concealed beneath the finest leather. Slender legs create a contemporary profile. We have selected buffalo leather for this range to allow the natural variation of the hide to come through. As a result healed scars and marks will appear through the finished coating. Produced in small batches, our soft buffalo is water finished. Changes to colour may occur when the leather is pulled or stretched creating a unique patina over time.